These upcoming pages of The San Fermin Echo were first published in short form in the daily Navarran newspaper, ‘Diario de Navarra’ and in a full version on their digital pages, every day from the 5th to the 15th July. They’ve been changed a bit from the original as it’s now post-fiesta, and any mistakes in these slightly revised versions are all mine, but as fiesta for me doesn’t begin to fade until a couple of months after it’s all over, we thought it would be nice to repeat and re-live those heady days of San Fermin 2014. We were going to put out two a week, but after the first two at the end of August, (July 5th, and then July 6th), things got in the way. But we’re back, and although Fiesta is well over now, remember…¡ya falta menos! Wow. The first encierro of the fiesta is done and dusted and it has to be said, that was not your average walk to work, was it? And like many regular Sanfermineros, I know a lot of people who use that as their morning run before starting their day. I may speak the lingo but I don’t know what the Spanish is for bonkers. But if one who fights toros is called a torero, and a butcher is called a carnicero, then this lot of locos have to be called bonkeros. Well done. It was, as ever, amazing to see and from where I often watch the run, Kukuxumus’s shop just before “la curva,” the sharp right turn into Estafeta, my heart was in my mouth for my friends who run there. A special welcome back to the awesome Jose Antonio. We have all missed you. So unfortunately, apart from a few cracking times, I was rubbish. But you runners who are good, how I envy you. Because these people don’t just run well, they’ve also saved their fellow runners from injury, and even death, by going back to help a stricken “mozo.” Salud! I was corrected a couple of years ago in something I wrote, about calling the pastors, “shepherds.” And the fella had a good point. But in the context of the encierro, I think shepherd fits better than herdsmen. These men are professionals and superb at it. 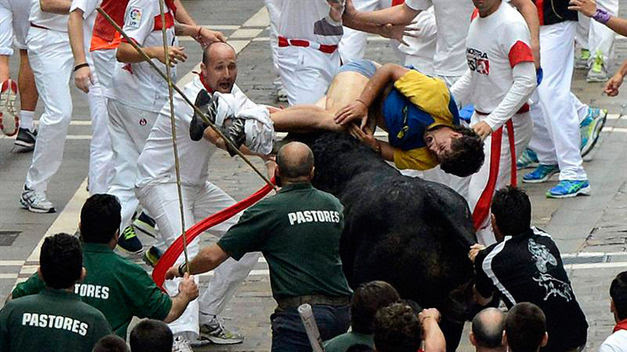 They don’t just have to contend with the bulls, but the people too. They are true shepherds, looking after not just the animal, but the human also. And many a time, with a whack of the long cane they carry as part of their job, they will tell you to flock off. But it is for your own safety, believe me. Goodness knows how many lives they’ve saved through their actions, but it must be hundreds. I wrote in the New York City Club Taurino journal last year about one of them, Germiniano Moncayola, who was the chief pastor for the encierros from 1929 to 1945. Honestly, he must have had some bull’s blood in him, because from what I’ve read and the photos I’ve seen he did some amazing things. All you have to do is do a little research and you’ll see. I don’t know any of the pastores but I have seen what they have done over the decades and if anyone deserves a special “Panuelo de Honor” it’s these guys. They aren’t part of that group we owe so much to in everyday life, like doctors and nurses, and firefighters and police…but, during fiesta, they are. 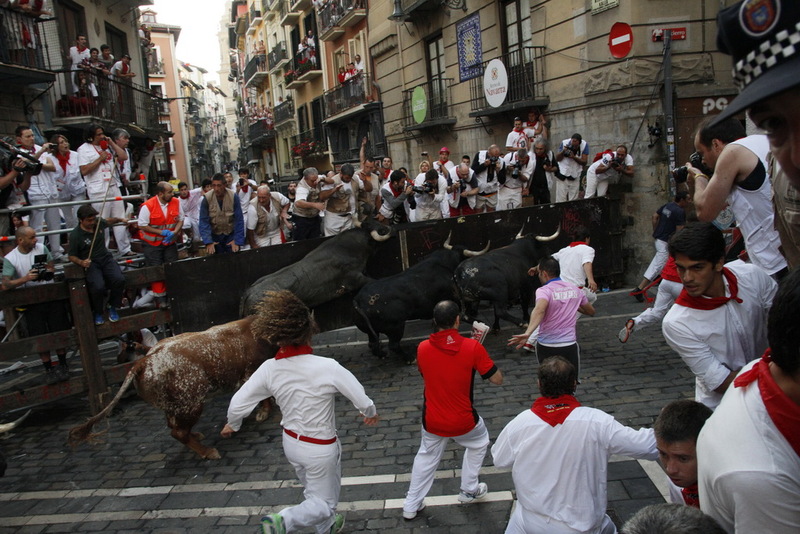 In Pamplona, along with the Red Cross, we owe them big time. Enhorabuena, chicos, y gracias. We are in Pamplona, the once-upon-a-time Kingdom of Navarra. Yup, we are amongst royalty and on mythical land. Along with certain people I think of as “Pamplona Royalty,” I also think amongst animals we have some special ones too. All animals may be equal, but some, according to one’s tastes, are more equal than others. Eagles, lions, wolves…and bulls. I mean the toro bravo, the fighting bull. Whatever your view is on the encierro and corrida, most people agree that the bull is an awesome looking animal. The power, the strength, the bravery and beauty are something to behold. And those horns…First-timers, take a good look at them before you decide to run. God and Mother Nature, with a little help from man, have combined to make one of the world’s wonders. One of the most famous breeds is the Miura bull, bred on a ranch in Andalucia. They have a certain fame when it comes to the encierro, and if you’re new to all this and are wondering what that “fame,” might be, then substitute the word for “infamy” and that should tell you all you need to know. I’ve chosen the Miura though not because of its deeds as a fighting bull or indeed a running bull, but because of its Navarran connection. Although they come from down Andalucia way, and the famous Zahariche Ranch, there is a local connection to them. It’s believed the word ‘Miura’ comes from the Basque words ‘mihura, miura, migura and mura.’ And it is also thought that the word ‘mihura’ derives from the Spanish word ‘muerdago’ which means mistletoe, and I really rather like that. So Miura bulls come from various stock, one of these being a Navarran bull. 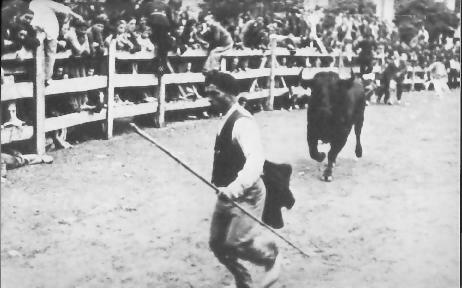 In 1879 the torero El Largatijo, Molina Sanchez, fought a bull called Murcielago in Cordoba. It survived 24 jabs and stabs from the picador and fought with such passion and spirit that this brave beast was saved and so became in the bullfight world what they call an ‘indulto,’ a pardoned bull. 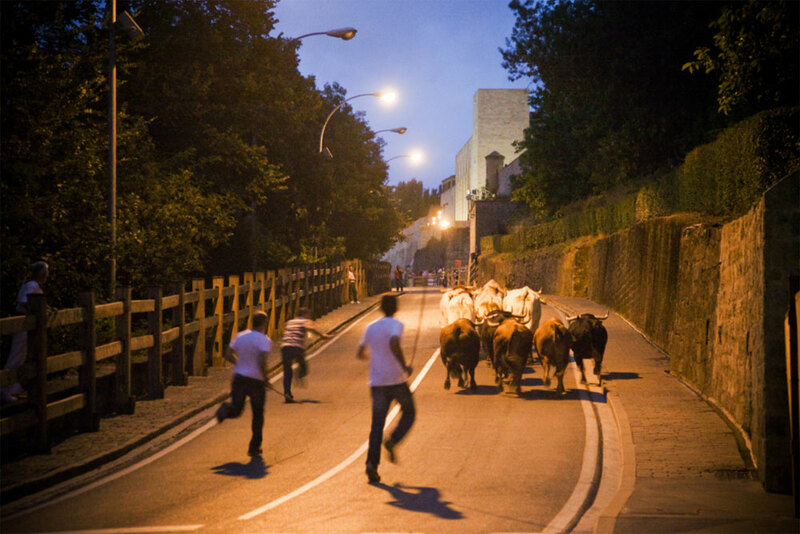 In 1915 during the Encierrillo, the night time run when the bulls are taken from the Corales de Gas to the corral at the start of the Cuesta de Santo Domingo where they are kept overnight before the run, a bull escaped and ran away. It was July 8th at about three in the morning when a young lad jumped onto a wall during the encierrillo to escape the beast but it jumped after him and fell over, and over and down to the banks of the River Arga. Thanks to the terrain it was hardly injured and eventually it was rounded up and taken to the corral. In 1922 a similar thing happened, a bull again jumping the wall and this time landing on a very leafy tree and rolling down, “like a pelota”, it arrived at those same river banks. This time it went for a very long walk and ended up at the Portal de Zumalacarregui/Francia where, according to the gatekeeper, it hit a young lad who took off running into town with the bull running the same way. To cut a long bulls-tail short, it was eventually rounded up after they closed all gateways in and out of that part of town, plus shut off some streets with boarding, wagons and yes, even cars, and it was eventually herded with oxen by various foremen from some quite famous ranches into the bull ring in the early hours of the morning. I’ve only been to the night run a couple of times, and it is particularly poignant. It’s pretty dark, and instead of the noise of the encierro and the mass of humanity it’s run in silence, with only the drovers present with the animals. But there are people there, and they are oh-so-quiet, almost as if in reverence. These beautiful bovine brothers are having their last night on earth, but they don’t know it. Okay, for today’s escape we are finally going to leave the city. Just. If you head towards La Mejillonera, The Mussel Bar, (that’s where the fountain of Santa Cecilia is, the one folk jump off to try and prove that man can fly without the aid of anything except alcohol), and keep going until you reach the end of the old town, you’ll come across the old gateway, (the previously mentioned Portal de Zumalacarregui/Francia). By walking through that and then following the winding road down to the main road you’ll find on just the other side an outdoor municipal swimming pool. It has changed since we first went there in the 80’s and I think it has actually lost a little of its charm, but it is still a fabulous place to go to relax and recuperate, and perhaps eat and shower too. It was an absolute gift for my crowd in the old days who had nowhere to sleep except the grass at the Hotel Plaza del Castillo, (so many stars, you can’t imagine) and we’d spend from more or less opening to closing time there. It was a haven of peace and tranquillity compared to the madness of town, and set us up for another night of fiesta when we’d head back in. If you’re still here after day three of fiesta, give it a go. You may well be grateful for the chance to clean up a little bit…and I’m sure others may feel that way too! The Sanfermin Echo 5 to 8 HERE.